System requirements: Ref. 6152/1 or GPF 2/56 case. Protecting the winding crown during underwater use. Release lever for winding the movement and setting time. Approved decades ago, the crown-protecting device turned into a legend many years later. 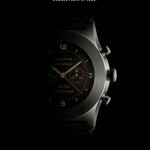 This “Panerai app” created an unique look which attracts watch collectors around the world. 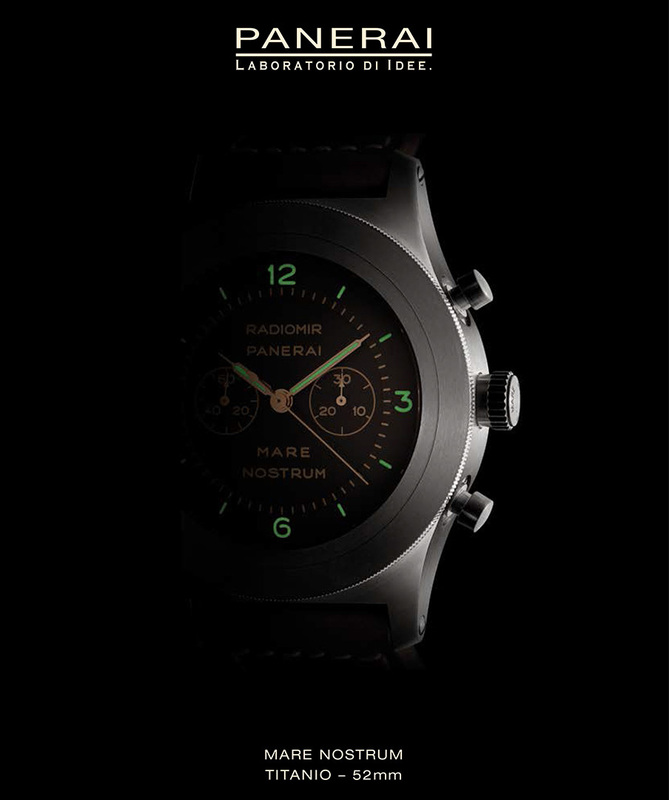 Available on modern Panerai watches, made for the public since 1993, the crown-protecting device carries the Panerai DNA from the past into the future. 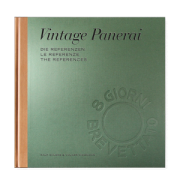 Vintage Panerai watches with crown-protecting device are featured in the second volume of our book “The References” (1950’s-1960’s) in chapters VIII, IX and X. …and carrier of the brand’s DNA until today and in the future. Watches of the reference 6152/1 are featured in four of the twelve chapters of our new “The References” books and part of the second volume (1950’s-1960’s). 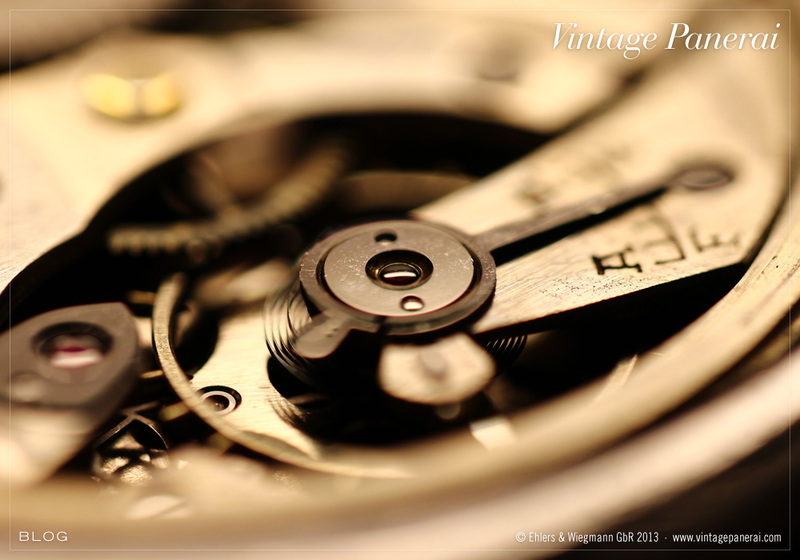 The 6152/1 watches with Rolex movements are featured in chapter VIII.I and VIII.II, 6152/1 watches with Angelus movements are featured in chapter X.III and X.IV. The photo shows a 6152/1 with Rolex movement, “Luminor Panerai” dial and crown-protecting device (chapter VIII.II, page 962-963). Enjoy reading! 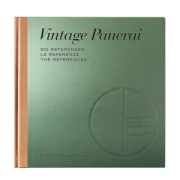 Our new “The Reference” books are available only in our bookstore. The SIHH opened the doors at the Palexpo in Geneva on monday, january 19th, 2015 with yet another ace out of the Panerai DNA: a new Mare Nostrum Titanio chronograph (PAM00603) with mechanical hand-wound OP XXV calibre with a power reserve of 55 hours. 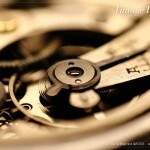 The movement is developed on a Minerva 13-22 base with 18.000 vibrations per hour. The 52 mm tonneau shaped case of the Mare Nostrum Titanio chronograph is made of brushed titanium, including a solid caseback, crown and pushers. Its water resistance is up to 3 bar. Typical for titanium watches from Panerai, this new Mare Nostrum Titanio chronograph bears a brown dial with two levels, just as the first vintage Mare Nostrum chronograph from 1943. The chronograph functions are controlled by two push buttons, reading the central seconds hand and a minute counter dial at 3 o’clock. The permanent second hand is at 9 o’clock. The new Mare Nostrum Titanio is a Special Edition with only 150 units. Its great to see that the historic design of the Mare Nostrum chronograph from the 1940’s will be carried into the future of the brand with this new release at the 2015 SIHH. 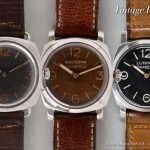 German editor Jens Koch wrote an excellent story about the unique design of Panerai watches, following their roots from the past until today and in the future. 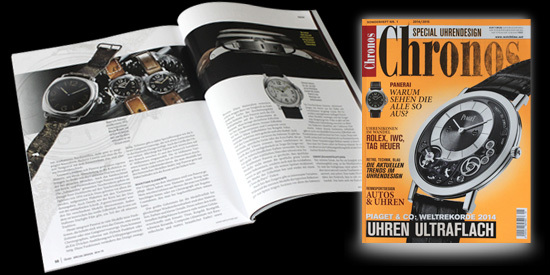 The actual special issue of “Chronos” watch magazine (“Uhrendesign” / “watch design”) features his story on page 92-100. 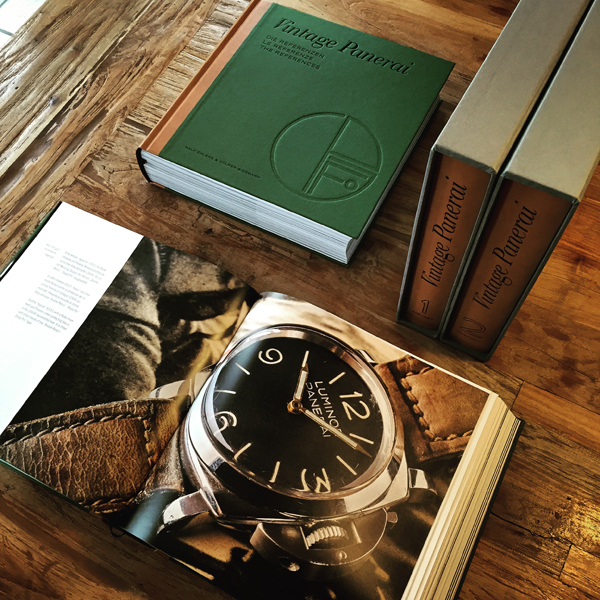 By describing the history of Panerai from the early beginnings as a supplier of the royal italian navy until today’s models, photos of Vintage Panerai watches are featured (Ref. 3646 / Type D “Kampfschwimmer”, Ref. 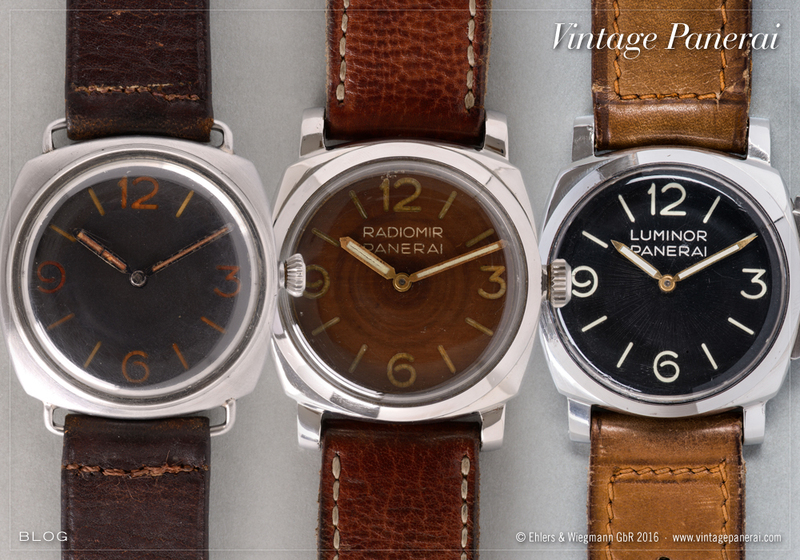 6152/1 “Luminor Panerai” and a GPF 2/56 “Egiziano Grosso”). 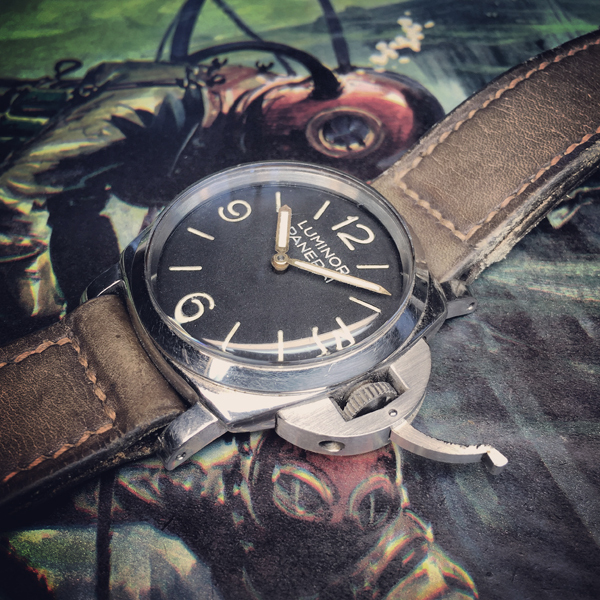 Koch explains in detail where Panerai today still use the DNA of the historic watches and how the brand can create new models by using the classic design elements today and in the future, as well as different case sizes and new materials. 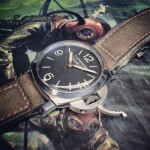 Doubtless one of the iconic Panerai design elements: the crown protection device. The patent was issued in july 1956 and described as “tight-seal device for the control knob of instruments, particularly for the setting and winding knob of watches”. 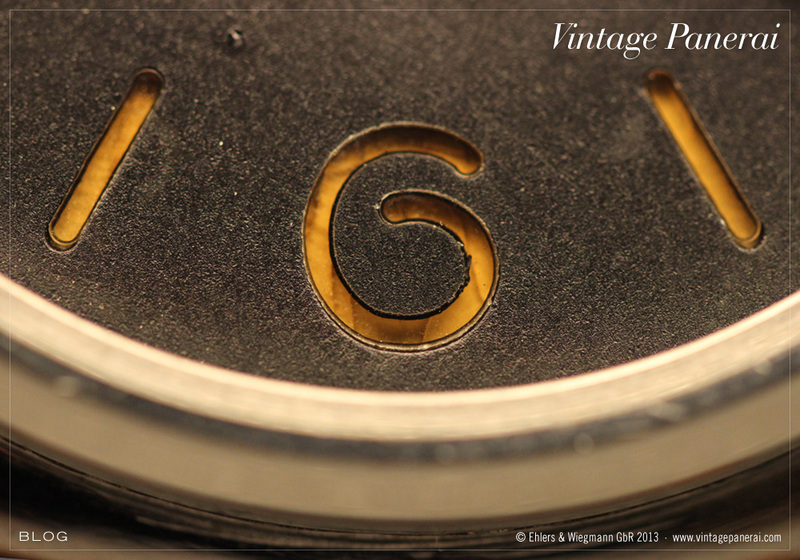 A 26 mm wide and 6.2 mm high area is milled out on the right edge of the polished case of Ref. 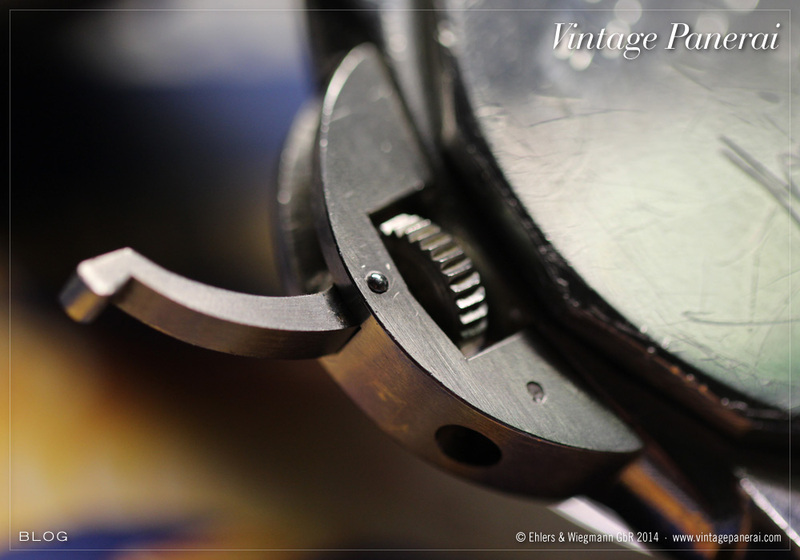 6152/1 watch, to allow a lateral attachment of the protection device, made from brushed stainless steel. 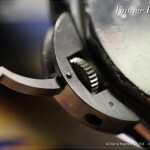 The protection system, which is extending 8 mm above the right side of the case is fastened to the case with two screws. The L-shaped protective bar (in open position visible on the photo) is 2.9 mm wide and pushes the crown down firmly to the case when closed. This Vintage Panerai watch is featured in our book “History1″. You can read more about its first owner Mario Arillo in chapter IV, page 227-391. Read more also in our book “The References” 1950’s-1960’s on page 924-927. 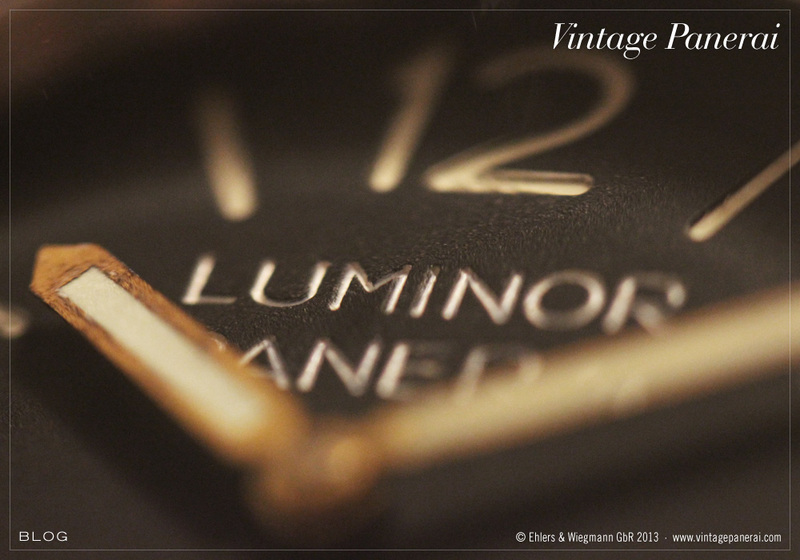 The milled numbers and markers of the sandwich dial construction aged different in many ways – some changed their colors in different intensity and got cracks in the luminous substance during the past decades. 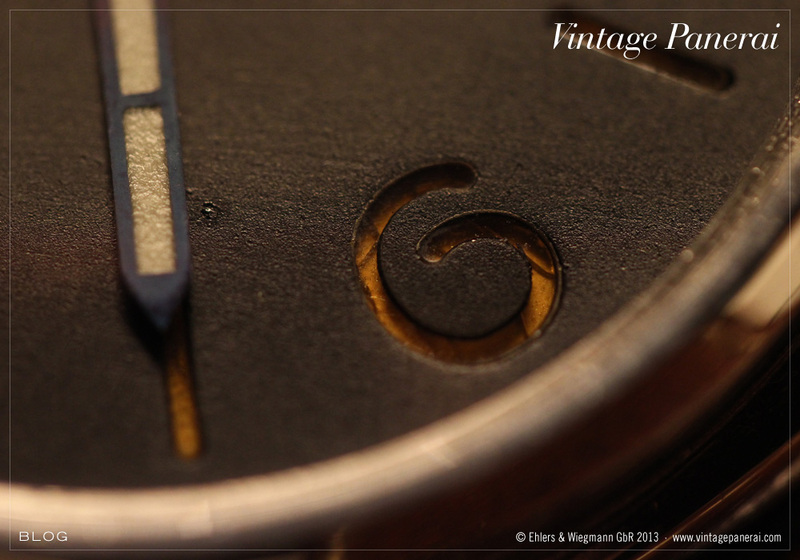 The reduced design of the dial – only 4 numbers and 8 indexes – represents the Panerai DNA on first sight. This Ref. 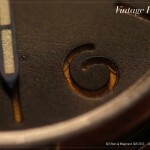 3646 / Type D watch is featured in our book “History2”. Read more about the first owners and the missions in which it was used as an important underwater tool in chapter V.
Close view on the movement of a Ref. 3646 / Type D. Used in Ref. 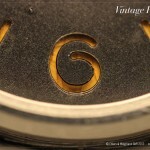 3646 watches from Type A to Type G, the Rolex Cal. 618 movement comes without Incabloc shock protection. Typical for the non-incabloc version is the serif font for the letters A-R (French) and F-S (English) engraved on the regulation device (later versions show “+/-” symbols – see also a comparing between Type 1 and Type 4 movements). 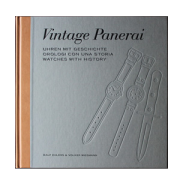 You can find more information about Rolex movements used in Vintage Panerai watches in our books “History1” and “History2”. 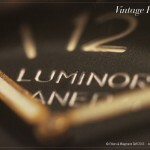 Close look at the “Luminor Panerai” dial of a Ref. 6152/1 watch. The surface of the sandwich dial with the milled and white painted letters is showing pure Panerai DNA above the double pencil hands. This Vintage Panerai watch is featured in our book “History1″. You can read more about its first owner Mario Arillo in chapter IV, page 227-391.